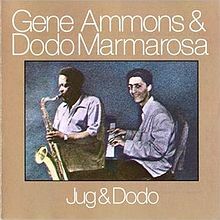 For You, written by Joe Burke and Al Dubin, was played by Gene Ammons (1925-1974) in his Jug & Dodo session in May 1962 along with Dodo Marmarosa (piano), Sam Jones (bass), and Marshall Thompson (drums). This version of the tune is up-tempo. Ammons’ two-chorus solo is one of his best, and contrasts well with Marmarosa’s sparser solo, after which there are several drum breaks before Ammons returns to the tune. After this, Ammons impressively improvises on the tag, playing a variety of phrases despite the limits of a repeating sequence. We also recommend Bluzarumba, one of Ammons’ own compositions, which is from the same album. This recording begins with a latin rhythm and then goes into 4/4. After his one-chorus solo, Marmarosa plays a ‘simple’ solo, once again fairly sparse but interesting nonetheless. Once again, Ammons and Thompson trade on this number, before Ammons returns to the melody. This number is at a slower tempo than the previous and there are fewer notes, but it is still a very interesting and at times exciting recording to listen to. Enjoy!